Peripheral arterial disease, in which the arteries, other than supplying blood to heart and brain narrow down. Globally, increasing adoption rates of minimally invasive surgeries and higher healthcare expenditure, rise in the awareness and improving government initiative and growing population of peripheral arterial disease patient are the prime growth drivers of peripheral arterial disease market. In addition, increase in adoption of treatment of peripheral arterial disease, and emerging economies such as China, India and others will create new opportunities for peripheral arterial disease market. However, higher cost of the research and development and increasing risk of side effects of treatment drugs are the key restraints for peripheral arterial disease market. This report identifies the global peripheral arterial disease market size in for the year 2014-2016, and forecast of the same for year 2021. 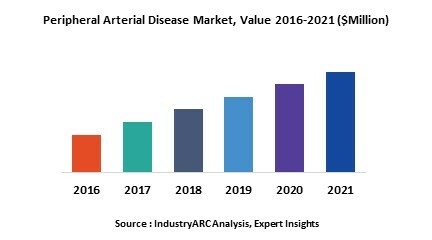 It also highlights the potential growth opportunities in the coming years, while also reviewing the market drivers, restraints, growth indicators, challenges, market dynamics, competitive landscape, and other key aspects with respect to peripheral arterial disease market. Geographically, North America dominated the peripheral arterial disease market, because of higher healthcare expenditure and patient awareness. Asia Pacific is projected to have the fastest growth, owing to rapidly increasing aging population, modernizing healthcare structure, and growing medical tourism in developing nations such as China and India in this region. Among all the devices, peripheral vascular stents has the highest market share in peripheral arterial disease market.